Happy MerMay, friend! This Porcelain Mermaid illustration started as a quick drawing in my sketchbook, but she just called to be more. I’ve been working on her in between client projects throughout this month. I hope you like here! 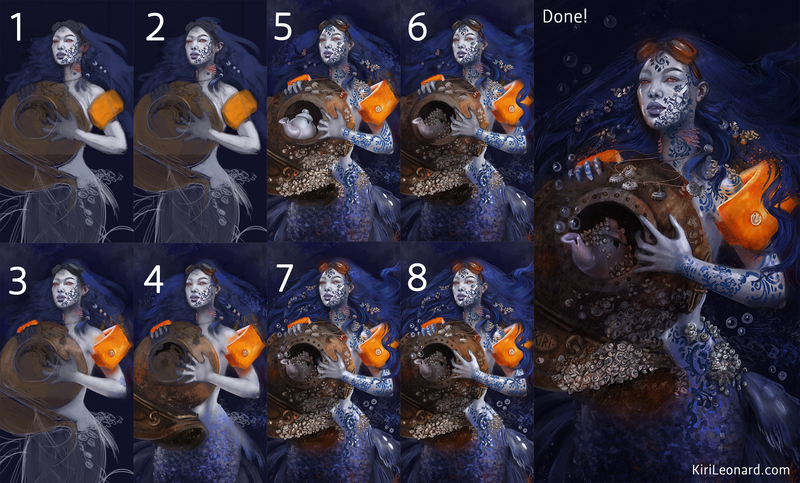 Here is a quick overview of the painting process, simply click it to see it at a larger scale. Award-winning Illustrator, Artist, and Creator Kiri Østergaard Leonard happily share her experiences making a living as an artist and pursuing a creative life. She grew up in a tiny village in the Kingdom of Denmark, left her country behind to pursue art in the bustle of New York City and now resides in the delightful weirdness of Austin, Texas surrounded by sunshine and felines. Locke the Legend: It was from a yeti! I love her! What kind of painting? Acrylic or is this digital? All Rights Reserved | Kiri Østergaard Leonard © 2019 | You may not use any content on this site without written consent.